Dine Out Vancouver is back for the 10th year. 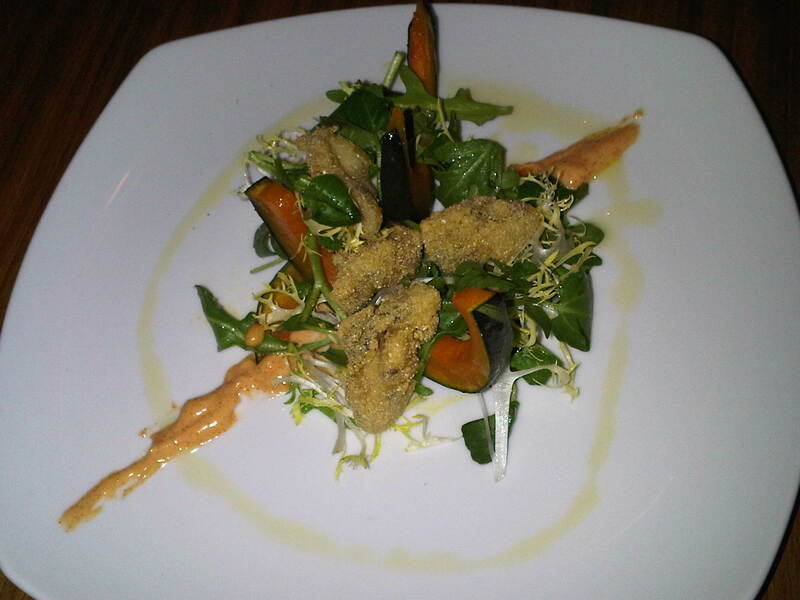 With over 200 restaurants participating, it can be hard to choose where to go. 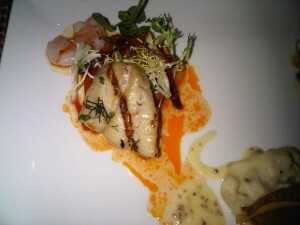 To help you make a more informed choice, I had the treat of trying four of Glowbal Groups Dine Out Vancouver menu, yes, FOUR! Here is my full report! The first place was their newest baby, Black + Blue. 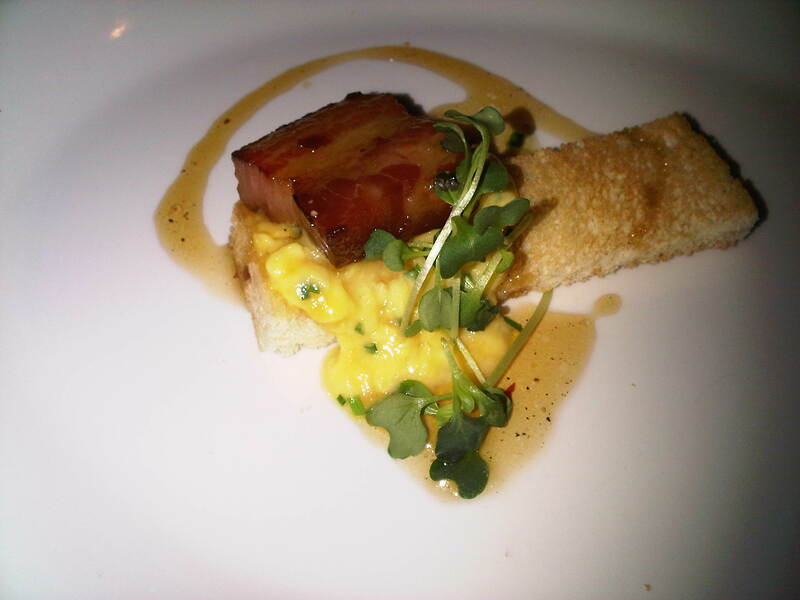 Our restaurant tour started in the lounge with a glass of white wine, and a starter of “bacon ‘n’ eggs”. This was a tasty bite…scrambled duck egg on top of a finger-sized piece of toast, topped with double smoked bacon. The swirl around it was a spicy maple syrup…something totally unexpected but works well! We also got tour of the private rooms upstairs, complete with wiring for A/V, keep that in mind for your next event! We then popped next door to Coast, where we tried everything on the dine out menu. Appetizer #1 was the Parsnip and Scallop Chowder, it was rich and creamy as you’d expect and with the traditional smoked bacon too. That was so good I had two servings! 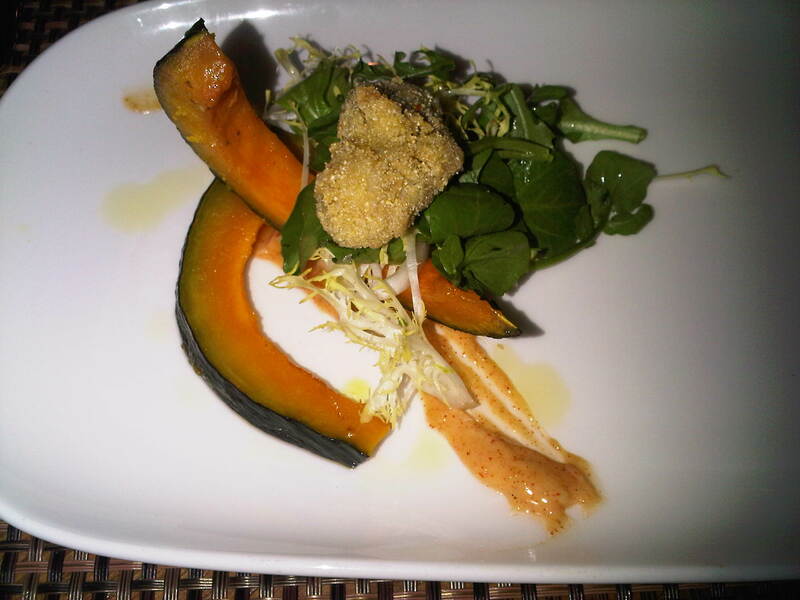 Appetizer #2 was a Fried Reid Island Oyster. We each got one on a bed of squash and arugula. The actual portions have quite a few more oysters. See? 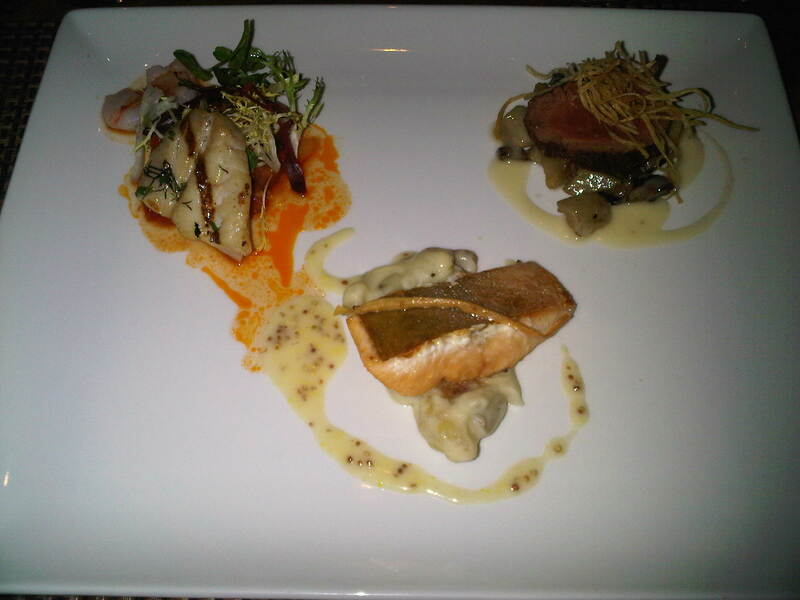 We were served the trio on one plate, but they also brought out “actual-sized” portions as well.On the upper right, we have the Grilled Tenderloin with mushrooms & sun chokes. 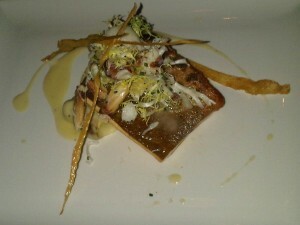 Down the middle, we have the Arctic Char. 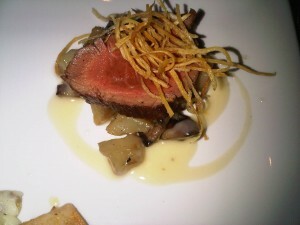 This was tasty and had a very nice & even sear all around. 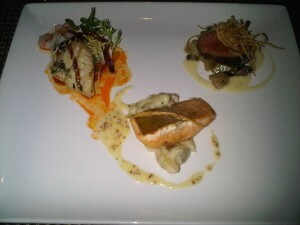 The upper left is the BC Snapper, and that really wowed me, yes, even a carnivore like me! Here are close-ups of each dish…and the actual portions you’d be served. I’d say this is well worth the $38. 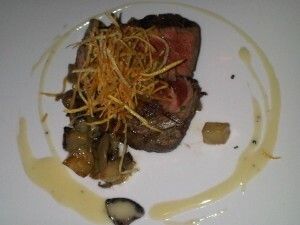 This tenderloin was cooked so well, I love the slight charring on the outside, and the wild mushrooms were really earthy. The sauce on the side is slightly truffled au jus. My advice? Go for the chowder and the Snapper. There is a choice to pair with wines as well for an additional $25, do it! 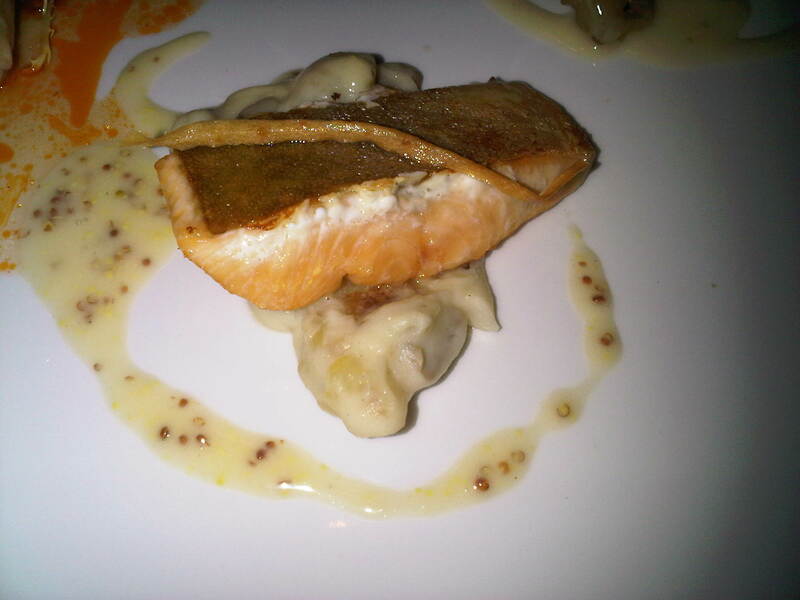 The Arctic Char had a really nice sear all around, and I really liked the grainy mustard…tasty! 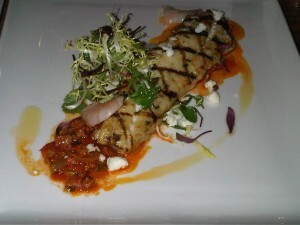 This was my far my favourite…the BC Snapper was grilled well, love those grill marks! The tiger shrimp sofrito is a nice pairing, serves to lighten the meatiness of the snapper. Across the street we went to the Italian Kitchen. We tried both the appetizers here as well. 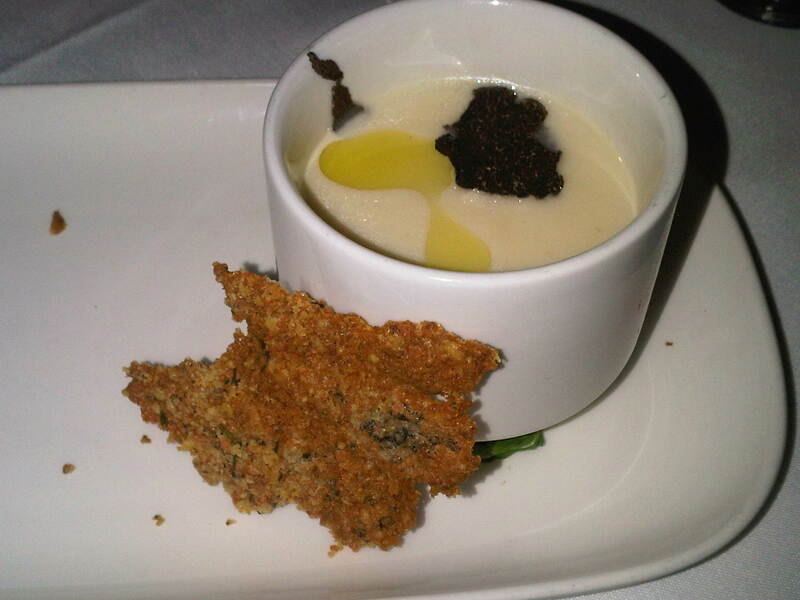 Another soup…this time a Celery Root Zuppa, topped with a drizzle of truffle oil and parmesan & truffle crisp. 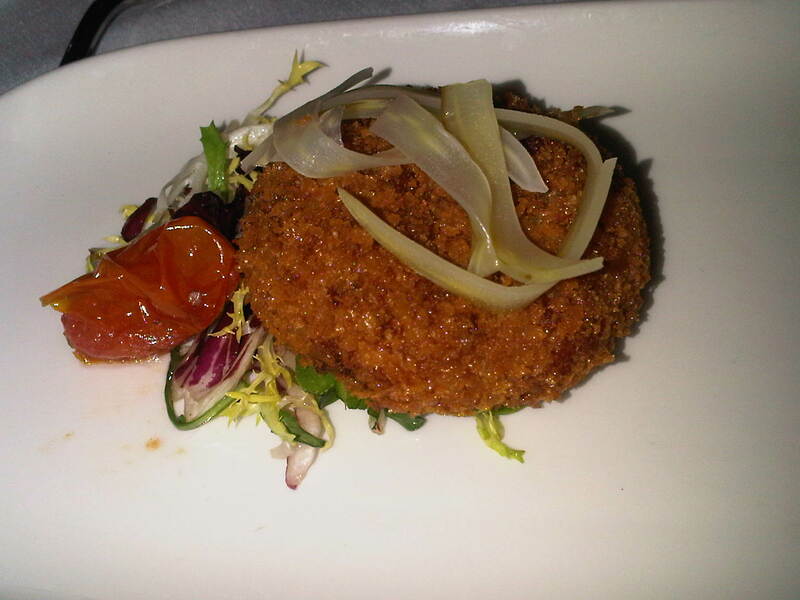 The second was a Prosciutto & Mascarpone croquette with a salad of fennil & tomoatoes. Hard to pick between the two but the zuppa is a great choice for vegetarians. We also got to try a duo of entrees…the Beef Tenderloin was nestled on a bed or asiago polenta and topped with some crispy onion rings. 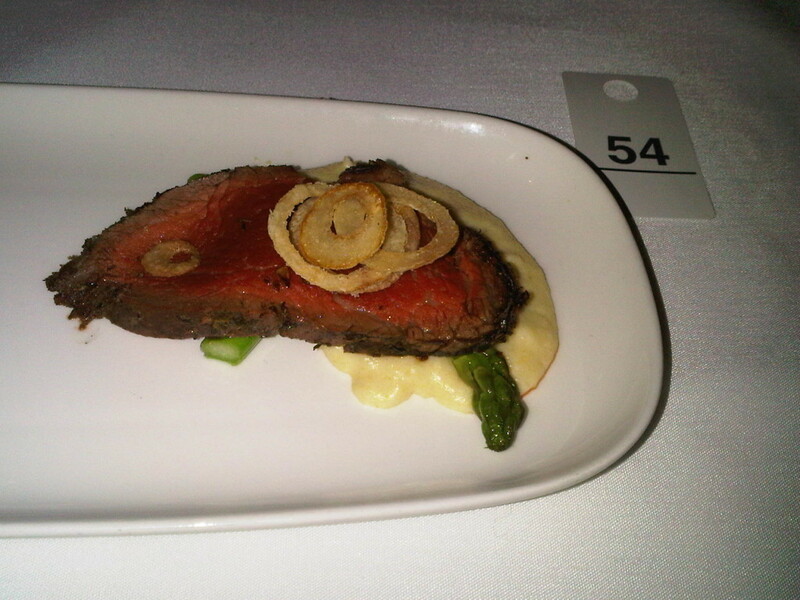 Cooked to medium rare, just the way I like it. It’s a solid choice for meat-lovers. 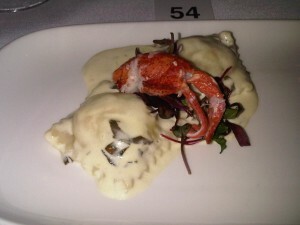 We also got the try the Lobster Ravioli, and yes, they know their pastas here. Look how plump these babies are, bathed in that mascarpone cream with a bit of greens to the side. 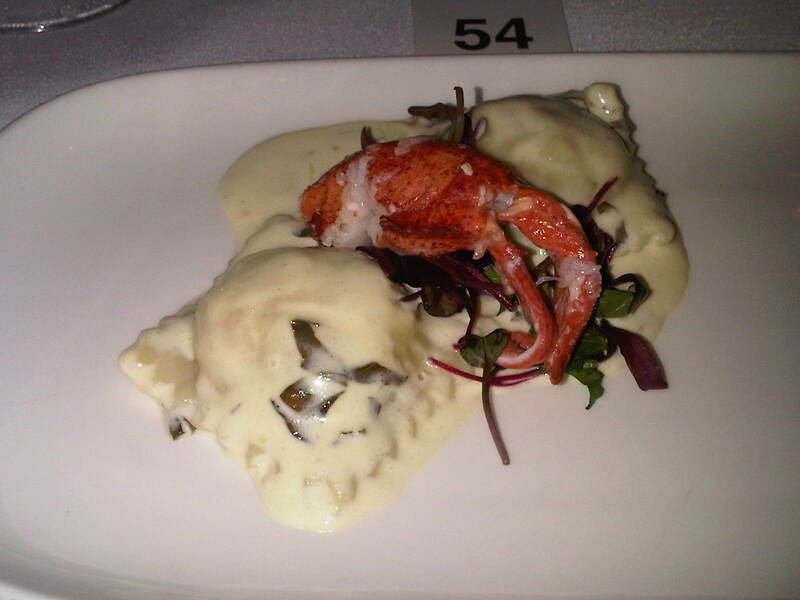 And yes, the lobster nugget was a nice touch. There was also a Baked Rigatoni Primavera that we didn’t try. 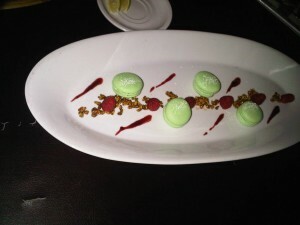 After all those savory dishes, we poured ourselves into Sanafir and headed to the beds upstairs. 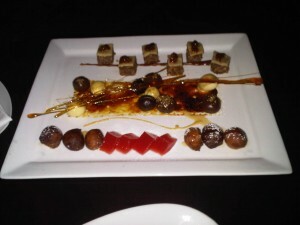 We were completely spoiled with rich and dense truffles featuring sea salt & star anise and orange & vanilla flavouring. 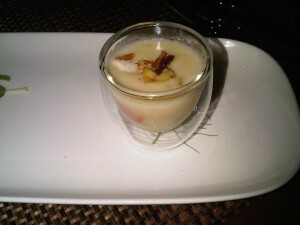 There was also a watermelon gelee, a baklava with fig marmalade and a zabalias with cinnamon creme anglais. And my all-time favourite? Pistachio Macaroons served with spiced pistachios!